My dedication and passion is to produce wood and paint renditions of avian and woodland subjects. 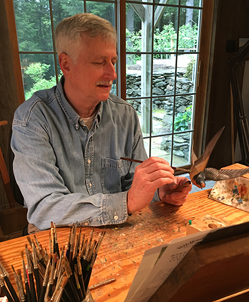 An artist whose work reflects his deep love of the American landscape and it’s wildlife, Bill Rice is highly regarded for his finely crafted bird sculpture, and has become respected for his small still-life and landscape paintings. Born in 1952, Rice is a self-taught artist who began painting as a teenager and began sculpting avian subjects while employed as a carpenter. Working with traditional carving tools, he creates dynamic renditions of domestic and wild birds, capturing their distinctive beauty as well as their spiritual essence. Rice typically incorporates some aspect of the bird’s natural habitat into each piece, a practice that contributes to the life and animation of his sculpture. He derives inspiration for his work by continually observing the habits and attitudes of birds, and taking field trips throughout the year and keeping an aviary at his home. Rice has been working as a professional sculptor for nearly twenty years, during which time he has received many “Best in Show” awards & several first places in such important competitions as the New England Wildlife Exposition in Wallingford, CT (1986, 1987, 1989), and the Ward Foundation World Championship Competition held in Ocean City, Maryland in 1984. 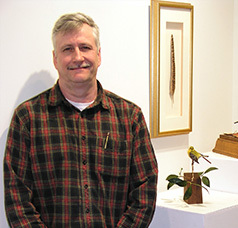 His work has been featured in many of the national wildlife annuals, among them the Cape Cod Museum of Natural History’s Birds in Art Show, and the Easton Waterfowl Festival in E aston, Maryland. He was elected a member of the Society of Animal Artists in 1997, and most recently honored with an invitation to participate in the National Museum of Wildlife Art’s Miniatures and More Show, Jackson Hole, WY in 2001, 2002, 2003 and 2004, the Bennington Center for the Arts Art of the Animal Kingdom Show, the Impressions of New England Show in Bennington, VT 2002, and the Leigh Yawkey Woodson Art’s Museum’s Birds in Art Show 2002, 2003 & 2004. His work is represented in the Ward Foundation Museum of Wildfowl Art, Salisbury, MD, the Leigh Yawkey Woodson Art Museum’s permanent collection, as well as private and corporate collections throughout the United States, Canada, China, England, Bermuda and South Africa. Galleries that represent Rice include the Spanierman Gallery, New York, NY, J.N. Bartfield Gallery, New York, NY, the Richard James Gallery, Charleston, SC, Settlers West Galleries, Tucson, AZ, the Gregory James Gallery, New Milford, CT. and P. S. Gallery, Litchfield, CT.